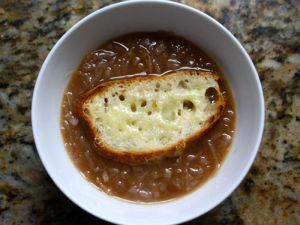 Caramelized French Onion Soup is a crock pot recipe that uses caramelized onions cooked a day in advance. Caramelize onions a day ahead of time. Cut onions in half. Cut halves into ½" thick slices. Combine all ingredients in a 3½-quart crackpot. Cook, covered, at HIGH 8 hours or until golden brown and very soft. Store in an airtight container and refrigerate. 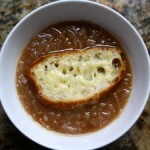 Combine onions, beef consommé, broth, water and thyme in a 3½-quart crock pot. Cook, covered, at HIGH 2½ hours or until thoroughly heated. Stir in wine. Ladle soup into 6 ovenproof bowls, and top evenly with croutons and cheese. Place bowls on pan. Broil 3" from heat (with electric oven door partially open) 5 minutes or until cheese is melted. Serve immediately.